Two years ago, I found a rather charming Fly Agaric. Something which has been catching my interest a lot recently is how many plants grow wild in our towns and cities. 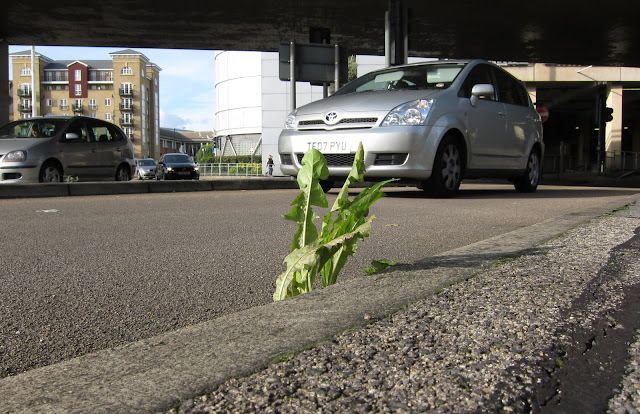 Look at this dandelion on a roundabout, almost under a flyover, close to the city centre in Reading. A dandelion seed must have blown here from somewhere. 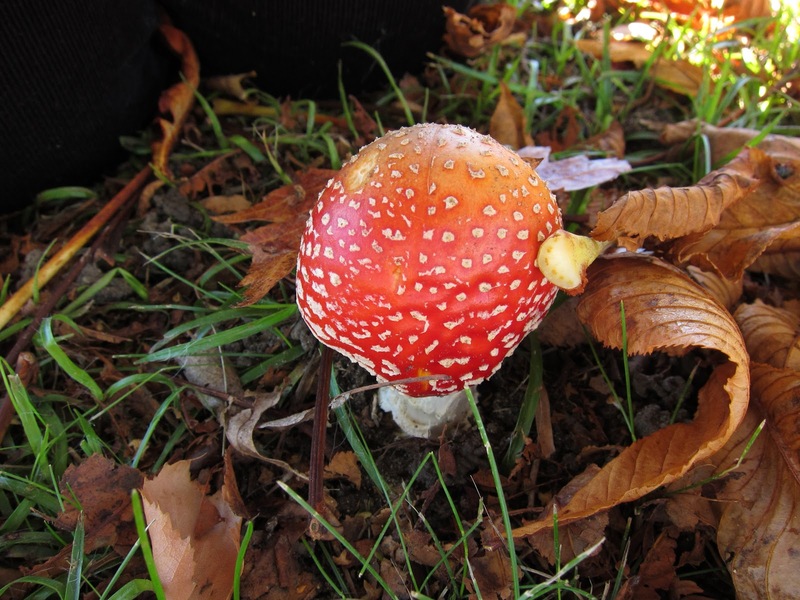 The history of the Fly Agaric (Amanita muscaria) I found last week may be more complicated. Although it is growing in a residential street where, by the look of them, the houses date from the 1960s or 70s, many of the trees in the area appear to be older than the buildings. In this photo, taken the next day, you can see some of the houses. Who lived here first? Humans or fungi? The beauty of a Fly Agaric seems short lived, especially in rainy weather. Here it is on the third day. Rather dilapidated! The next bit, though, is even more exciting. There’s a programme on BBC Radio 4 called ‘Saving Species’. I don’t specially like it but happened to turn on while they were describing a fungi foray in the New Forest (Hampshire). For people unfamiliar with the New Forset - it’s old; pretty old. William the Conquerer set it up in 1079 to hunt in. (You know him - 1066 invasion.) If you want to know more, here’s a link. We have family conections with the New Forest so I listened. Many readers will know how bloggers get to know each other through the internet (garden bloggers especially, it seems) and this group of fungus identifiers had met through a site called Ispot - a recording and identifying scheme set up by the Open University. The programme itself wasn’t very inspiring but there was a link from its own site to Ispot. This is what it’s like. I’ve been uploading onto Ispot pictures of the toadstools I found amongst the urban trees of Berkshire. In some ways its been disappointing. I have what claims to be a pretty comprehensive fungi identification book (Collins Complete Guide to British Mushrooms and Toadstools). That such books exist suggests you can identify a fungus from its picture but I wasn’t managing very well. In fact, I wan’t getting anywhere at all! So I arrived at Ispot with great expectations that I’d be able to upload a picture and get a quick and accurate response. It turns out that even people who know a million things more than me can’t necessarily say what’s what and this is both disappointing and encouraging. It’s disappointing to find there is no easy route to answers through pictures. On the other hand, I have gone back to being happy about making up my own names for things rather than risk misleading. One Ispot member said some fungi can only be truly identified, one from another, when spores are put under a microscope. You’ll find my pasta and slug fungi keep their names for the present! Here’s an example of a toadstool I reckoned I had quite a lot of information about. I supplied three angles. Yet a decisive identification turns out not to be possible. Could it be an Amanita Pantherina? Or is it an Amanita Muscaria (a Fly Agaric) that is past its best? The solution may simply be to call it an Amanita and leave it at that. Beautifully vague! It may be a Laccaria Laccata in an early stage. And this may be a Laccaria Laccata at a later stage. And here’s another exciting thing. Through joining Ispot I found this site of nature photographs - it belongs to a very helpful Ispot expert. And look at these fungi photos there! So, all in all, a happy and interesting fortnight! So glad to see more on the amanita--and thanks for the info about Ispot. I've decided to follow them on Twitter, even though I'm in Canada rather than Britain. There are always commonalities. I loved this and will wander over to Ispot when I can - meanwhile your images are great and the seaweed too! I think I am going to join up - normally if I am stuck on ID of something in the wild I put a photo on the wild about Britain site. I tried to ID some fungi from your visual fungi link last week and still found it hard - so you might see some of my photos on that new site next week. I took some photos aswell of the agaric a few weeks ago and someone has just told me that our local bluebell wood had lots of them a few weeks ago. I hope those photos load up for you later - typical UK broadband at the weekends is so slow. Thanks again Lucy for those links. Jodi - I'm not on Facebook but took a look at your link. I realise I've seen this page before but can't remember why! I doubt the illustrations there do justice to their detailed work. Catherine - when you have visited Ispot - do let me know what you think. Rosie - one of the interesting things about the Visual Fungi site is that it documents in detail the area where its owners live. I find that fascinating - and, hopefully, useful too when there are overlaps. However, you are a long way from their Sussex base so I imagine some of the fungi you are seeing won't be illustrated. Ispot, having a wider geographical base may help in that. It will be interesting to know your experience when you join. I can't help but enjoy seeing the photos even though I find identification hard! Which just goes to show that identifying fungi is very difficult. No wonder we are not all rushing out to gather wild mushrooms. The difficulty with identifying mushrooms is why I won't eat one in the wild. You can never be too sure. I love the look of this blog. Easy Gardener - I think a ramble with a garden expert would be very interesting. I'm always surprised how many toadstools and mushrooms there are. I recently bought a Collins Complete Guide to British Mushrooms and Toadstools. It is about an inch thick and there are roughly six entries per page with facing photos. Lots and lots and lots of them - and many of them with weird and wonderful shapes. Rosey - so glad you like the look of Loose and Leafy. Agreed about eating wild mushrooms. Awful risks. Thanks Fer. I'm glad you like the photos on the urban toadstools post. Anna, have you visited Ispot yet? If so, what did you make of it? Hey there, I thoroughly like reading your website and I was wondering if there could be a method I can join so that I get an email everytime you create a brand new post. I can not see an RSS button or an email form, but possibly I just missed it. At any rate, keep up the remarkable posts.